I have a basement shop that had some lighting put in by the builder. It was enough to keep you from running into things but wasn’t really the quality of light that you would like to have while woodworking. So I had been looking at putting in something that would provide better light while I was working. Originally, I was thinking about standard T8 fluorescent tubes. While fluorescent has never been the kind of light that I prefer, for shop lighting it’s probably been the most popular option. However, in the course of trying to figure out which brand’s fixture would work best, I stumbled across these 40 inch LED light fixtures from Cree. Each fixture is rated to put out 4000 lumen (should be about the same as a 2 tube F25T8 fluorescent). At 3 and half pounds, they are much lighter than fluorescent fixtures and install easily. I installed two fixtures in about 30 minutes. The down side is that they are significantly more expensive than a fluorescent fixture. The up side is that they use less electricity, don’t have cold temperature issues, and are immediately full bright. My shop area is significantly brighter than it was before and I am happy with the results. I would consider these a good option in either a garage or basement shop when cold temps in the winter can give fluorescent lights fits. However, if I had to put in a lot of fixtures, the price differential might have made me stick with fluorescent. Interesting. Thanks for bring this to everyone’s attention. May I ask how high your ceiling is where they are mounted? Are you having any issue with glare? What color temperatures do they come in? Wheee, at $200/fixture they are definitely more expensive but I’d love to switch over. I have LED under cabinet lighting in my kitchen and love it. Glad to see you are using the latest, most efficient technology available! I have switching out all my old lamps and fixture a cost allow. The first LED I used professionally only put out a pin point amount of red light. That was in 1972 and no one at that time would have thought that they could replace lighting in the home or headlights in automobiles. LEDs have certainly come a long way! I found this one on Google shopping, is this the one you have? When I was a teenager in the late 70’s I made a clock radio with big LED numbers from a Radio Shack kit. I asked an electronics technician how long the LED’s would last and he told me longer than I would. It’s still going strong 35 years later and except for power outages is always on. I, too, am slowly replacing the bulbs in and around my house as cost permits. They’re costly up front but hopefully I’ll never have to replace them. Another benefit of LED lighting – it does not attract bugs!. 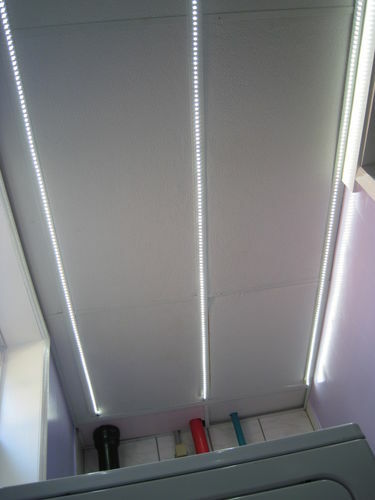 The UV wavelength in incandescent and fluorescent lighting is what attracts them. It’s a little late in the year now, but to test this put one in an outside light fixture on your front or back porch. If you like to leave doors to your shop open in the evenings but the bugs are a problem, LED’s will greatly reduce the bug count. I have been playing with LED strip lights as of late. 27 feet of light lights up a 6×10 laundry room very well. My installation was 3 strips of 9 feet each all run to a single transformer 110VAC to 12DC. The only catch I encountered was that my old motion sensor switch would not work, it made the lights flicker fast. This required a LED motion sensor switch. Currently I am working on a LED set-up for my utility shed, measures just under 8×10. So far using a single 16.5 feet strip have what I call a nightlight. Enough to see and navigate the small shed but not enough to see any details such as a measuring tape in a shadow. I am guessing it will need a total of 3 LED strips (50 feet) to get the light up to par with my previous 4 incandescent light bulb set up. Below is a picture of the laundry room set-up.